Spain was home to 296,600 British citizens in 2016, with almost half (40%) of retirement age. In the last ten years, the number of those aged 65 and over has jumped from 56,291 in 2006 to 121,181 British residents in 2016. With the older generation eager to while away their golden years in the sun, it is no surprise that Spain is so popular with retirees. As it is easily reachable, the tourism industry in Spain is thriving: the Frontier Tourism Survey from the National Institute of Statistics highlights that 2017 is set to be the fifth year of historical highs for Spain’s tourism industry. Since flight companies announce regularly new routes to Spain, its easy access makes it appealing for retirees. According to ONS figures, in 2016 643,000 visits were made to see family or friends. “Here at Taylor Wimpey Spain we welcome the release of this new data by the ONS as it confirms the picture we are seeing here on the ground that Spain remains a top choice for Britons relocating with almost 300,000 British citizens calling Spain home. The prospect of retiring to the playas of Spain has always been attractive to British citizens. In terms of location, Spanish leading homebuilder Taylor Wimpey Espana notes that the coastal province of Malaga on the Costa del Sol is the most popular location for older buyers: 50% of totals sales come from British buyers. Taylor Wimpey Espana offers a range of properties suitable for those in their ‘third age’. 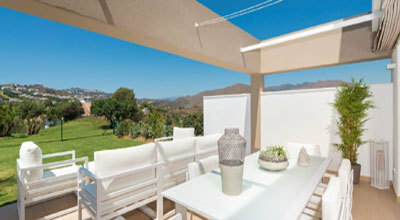 New terraced homes at Horizon Golf enjoy a stunning location in the beautiful Valley of Mijas. Priced from €280,000 + VAT for an apartment and from €399,000 + VAT for a penthouse, the private gated development offer homes that have 2 or 3 bedrooms, 2 bathrooms. They all boast panoramic views over the complex’s famous Campo Asia golf course and La Cala de Mijas. La Cala Golf Resort, where Horizon Golf is placed, is a residential area with golf, restaurants, SPA, hotel, good communications to airport, etc… perfect environment to retired people. Malaga’s international airport is only 30 minutes away and all properties benefit from a hydrotherapy center and spa, a golf school, as well as 24-hour security, the communal gardens and swimming pool.